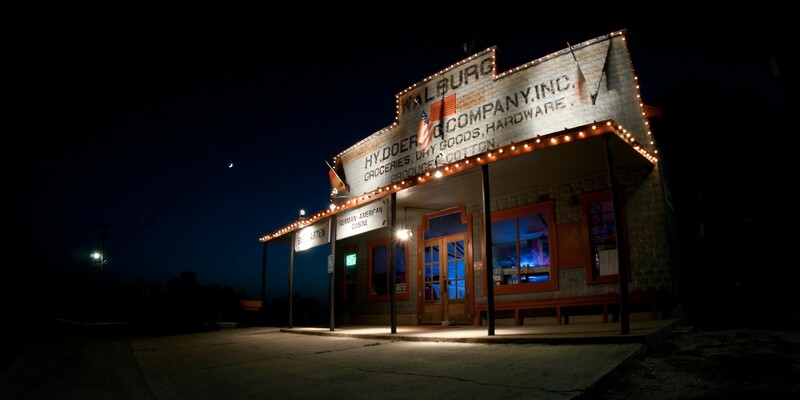 The Walburg Mercantile building was built in 1882 by Mr. Hy Doering. The original use of the building was as a mercantile supplying the surrounding farming community with dry goods. Mr. Doering was born in Walburg, Germany, and migrated to America as a young man. Upon his arrival in America he purchased numerous acres north of Georgetown, Texas, the County Seat of Williamson County. Doering named the town after his birthplace in Germany and built the Walburg Bank, Walburg Mercantile, his home and several barns. He encouraged fellow German immigrants to settle in the area by selling land to them. Building on this tradition, two German immigrants united to start what has become a dining destination. In early 2000’s the Business Incorporated to Walburg Investment Group LLC. Members Including Ronnie Tippelt & Randy Light. Their two families with united efforts, and a great staff has made it what it is today. The Walburg Restaurant brings you a truly authentic German experience in dining and entertainment. With much research and rigorous selection, we have found chefs to continue the legacy of German cuisine from our Bavarian heritage. Our 1882 vintage structure seats over 250 which easily accommodates large parties. Just behind this antique dining establishment, nestled in oak trees, is our Biergarten including a large open tent with two stages for live entertainment. This area also includes an open picnic area, outdoor bar and kitchen and arcade for the kids. Our Biergarten is great for large groups, Class or Family Reunions. Meanwhile you will be entertained by well-known yodeler and accordionist Ron Tippelt from Munich, Germany. With his personality and skills as a musician, Ron has become a favorite live entertainer and recording artist, yodeling his way into the hearts of Texans for past 35 years, Ronny and his band, The Walburg Boys, have performed in such places as The Taj Mahal in New Jersey, New Ulm, Minnesota, Wurstfest in New Braunfels, Helen Georgia, Choctaw Oklahoma, Addison Texas, Fredericksburg TX, and the Munich Oktoberfest, as well as other places all across the United States. The Walburg Restaurant is also a venue for numerous local and traveling artists who perform throughout the year in our Restaurant and Biergarten.